I have a HUGE amount to catch up on with this blog (I feel like I'm always saying this and never managing it). It's been neglected for far too long. I've been so busy which is a good thing and I'm feeling much happier in general these days but I miss sharing our experiences have so many plans including another new guest blogger and continuing to improve our content and photography. On that note, please see my new photography website - Bexphoto.com. Apologies that the photos in this post aren't great, they're all iPhone as I hadn't expected this adventure and my jet lag addled brain/body wouldn't have coped with the heavy Nikon anyway! We just got back from a couple of fantastic weeks in Malaysia visiting my parents for the first time with the twins so I have plenty to share about our adventures abroad. It will take a while as November is already looking majorly hectic with the twins' birthday, my niece's naming ceremony and 1st birthday party and lots of meetings for my various clubs! 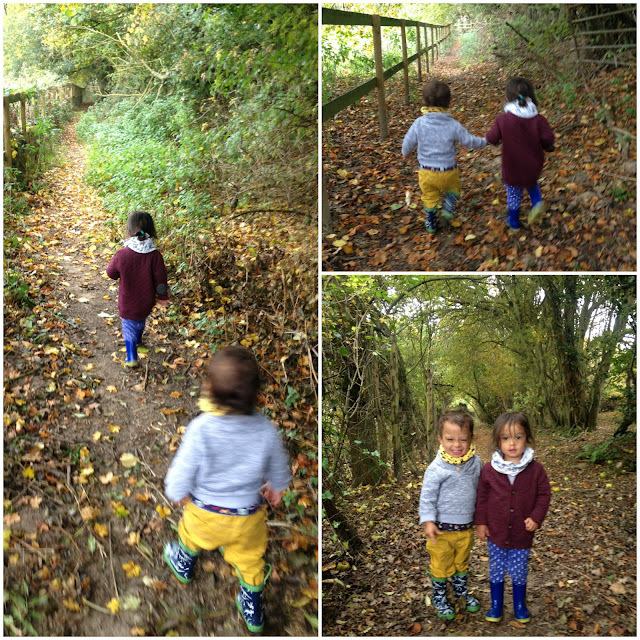 For now though, I want to share our jet lag fuelled walk to refresh us all and enjoy the crisp outdoors of Sussex again after our humid tropical escapades! We had a lovely walk through the leaves and rotting apples en route to the chorus of "apples" (K) and "dabbles" (P) until I said not to touch as they were bad apples on the ground so the chorus then became "bad, bad bad" with a mixture of the above apple related exclamations! They were, as often, super cute, holding hands and giving each other cuddles (these are usually one way from K to P) and when I asked them to stand over there for a photo, K put on a smile - the first time he's ever done this before they both proceeded to only look at the ground in front of me for some reason! Anyway, we continued down and they walked all the way with only a little persuasion at the end as they were about to give up, demanding to be carried. Turns out a friend's husband was there with the twins' friend Seb so we had some lovely company for our coffee and flapjack before Alan took Seb over to see the tractor which arrived with some apples. 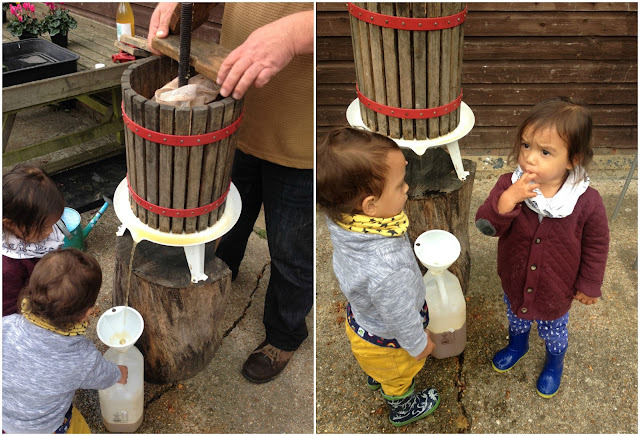 The little ones (and big ones) were then invited over by Bob to help with apple pressing. 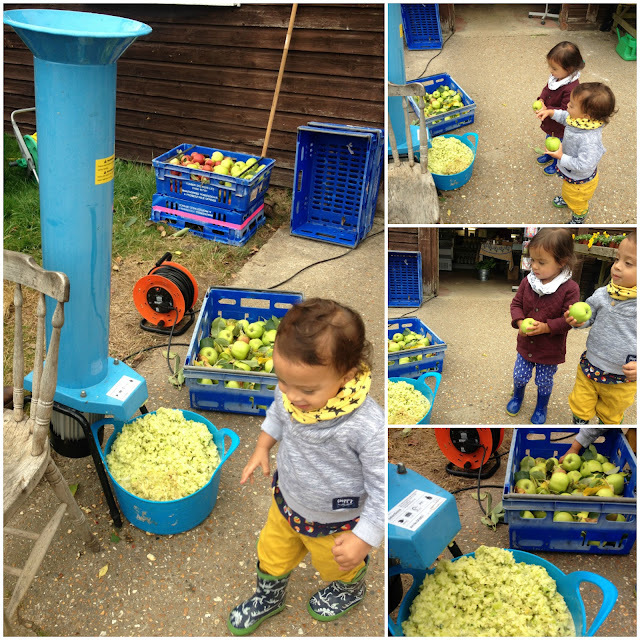 We jumped at the chance and the twins loved throwing the apples into the pulper and then catching the juice from the presser! Bob was SO lovely and great with the kids, they had a blast! 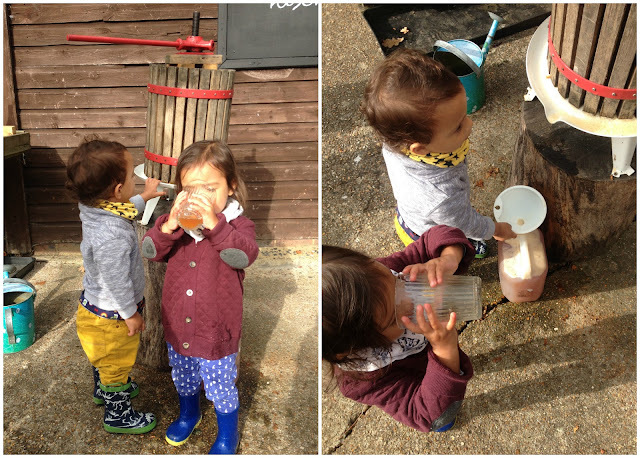 Not to mention getting their first taste of juice (we are a fairly strict household when it comes to sugar with only water or milk being the usual) and it doesn't come fresher than this! Needless to say, they wolfed it down and Bob very kindly gave us the first jugful to take home. 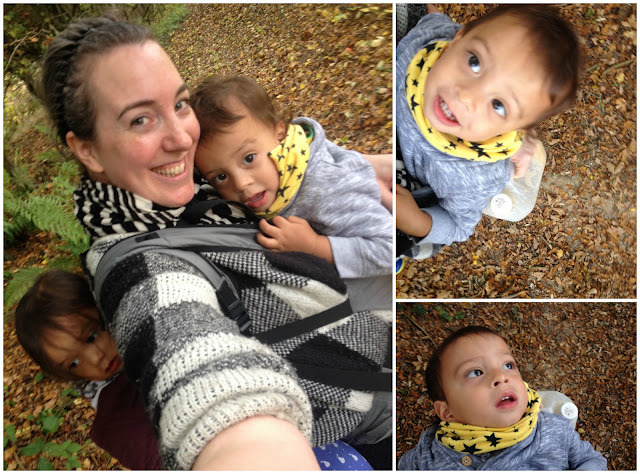 Of course, they both wanted to be carried back up the hill but I'd come prepared with slings so strapped them on and away we went with our spoils. K was happy looking at me and looking at the leaves above us. 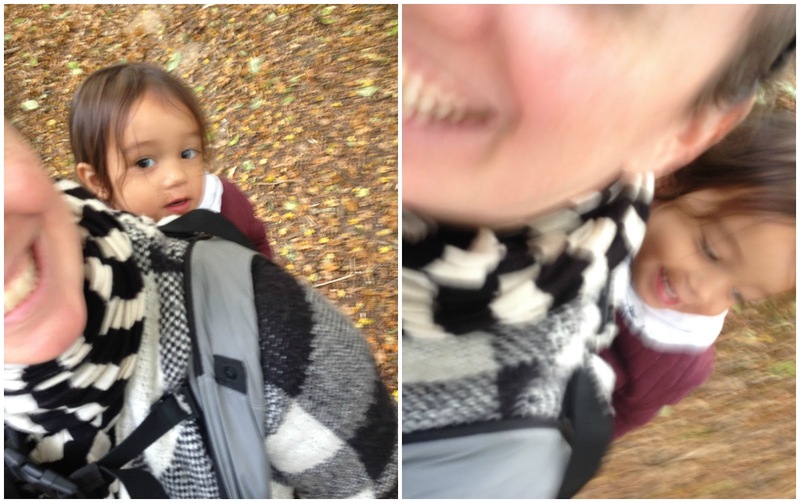 P was happy being bounced on my back as we hiked back home. Phew, knackered is an understatement but I'm wide awake now so making the most of some peace to catch up on a few things. 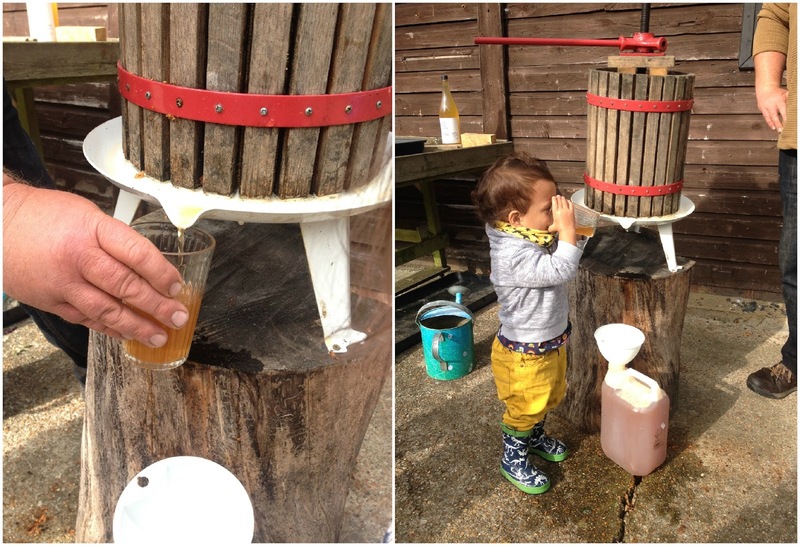 Poor Daddy hadn't even managed to sleep so he missed out for nothing and is currently snoozing away while the twins nap but he was delighted with the juice and has frozen some to keep it fresh. I'll be sharing a proper review of the new Oast Farm Cafe soon as my new brunch club is heading there for our next outing!